A veneer is an ultra-thin layer of material (usually made of porcelain or composite resin) which is placed over a tooth to either restore a tooth’s structure, as they are commonly placed over a chipped or cracked tooth or used to improve the aesthetics, discolouration or misaligned tooth. Veneers are usually bonded to the front of your teeth which preserves the tooth’s natural structure while concealing any discolouration or cracks. Veneers generally go undetected as they are colour matched and mimic the texture of your natural teeth, which will ensure a confident, natural looking smile. Porcelain veneers are one of the most popular oral cosmetic solutions as they have many advantages. Veneers, preserve your tooth’s natural structure and is thus less invasive than other procedures. Furthermore the bonding process can strengthen teeth, due to the added structure and mass and are often used to strengthen cracked or chipped teeth. The most notable advantage are the aesthetics of veneers, as they can go undetected within your mouth as they are colour matched to your smile. Veneers are also used to conceal small imperfections such as discolouration or stains, as well as dentine which can be exposed due to the wear down of enamel. Veneers can also help the appearance of your mamelons which are the small ridges on your two front upper teeth which are required to break through the gum. A lot of people will also be attracted to veneers if they experience the appearance of slightly buck teeth or short stubby teeth, which are generally genetic conditions. Stubby teeth may also result from bruxism (teeth grinding). Veneers help cover such conditions. It is essential to note that both porcelain and composite veneers have advantages and disadvantages. 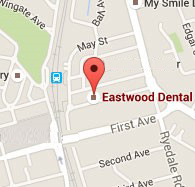 Out team at Eastwood Dental will help you decide which material is best suited to your budget and lifestyle. Porcelain veneers, like composite veneers, take a natural aesthetic which will ensure they go undetected amid the rest of your teeth. Porcelain veneers are resistant to staining and are relatively durable. However, if they do crack or chip, the entire veneer must be immediately replaced. They also are most commonly made offsite at a dental lab as they are custom-fit which means fitting a porcelain veneer will take a few weeks. Composite resin veneers on the other hand are usually attached in one visit, as the veneer is sculpted onto your tooth by your dentist. Chips in composite veneers can also be repaired and are cheaper than porcelain veneers.